it will last for a very long time. 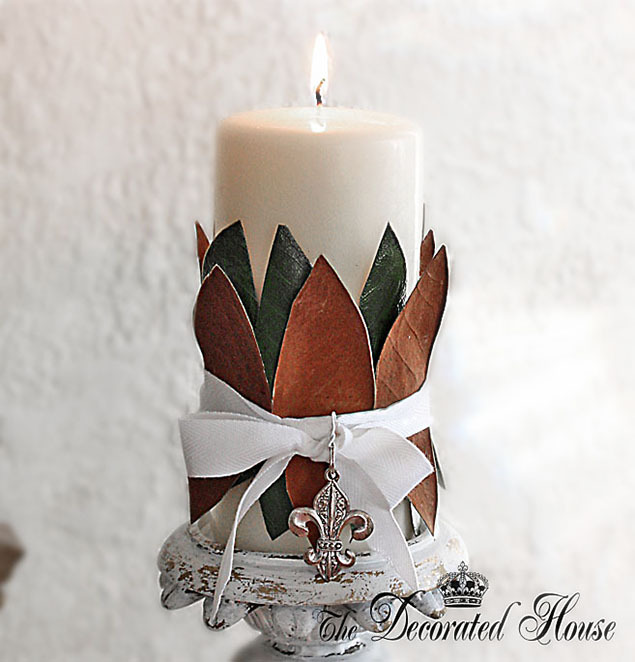 Here is how to create this very simple, but really pretty decoration. * Start with a larger, chunky size candle, although you could so something similar with two matching smaller candles, or just one if you wished. * Find leaves in Nature that are strong, pretty, and clean. Of course you an purchased preserved leaves as well. I chose magnolia leaves for the beautiful colors. * Put a rubber band around the candle. * Arrange your leaves inside the rubber band so it will hold them in place as you want them. You can see with the magnolia leaves you have two colors, so you can alternate them for the look above. * Tie a pretty ribbon around the rubber band to hide it. Then if you want you can add a charm, another decoration for Fall, Winter or Christmas. Something simple, you don't need much of anything. You can use your candle as part of arrangements on a mantel, table or anywhere you might think of! Oh, Donna, this would work wonderfully with my decor this year! I'm using magnolia branches and fleur de lis ornaments. I may have to take a few of the leaves and try this!